Reading the story, I felt compassion for Durkin, who had fallen victim to one of fear’s most agonizing and intractable manifestations. And I wondered how many other careers have been cut short, or held back, by runaway fear. You don’t have to be a performer to suffer from performance anxiety – anyone who has to give talks before an audience, or even speak up at meetings, is at risk of a debilitating attack of stage fright. There isn’t a lot of data on the subject of performance anxiety in the workplace, but it is a variety of social anxiety, and in a study published earlier this year, Ethan Moitra of Brown University found that sufferers of social anxiety are significantly more likely to wind up unemployed or underemployed. Clearly, even when it doesn’t spur panic attacks, as Durkin’s anxiety did, fear can hem us in from pursuing our objectives and taking the risks that are essential for success. On the other hand, there are few forms of fear as intense and debilitating as stage fright. As I write in my book Extreme Fear: The Science of Your Mind in Danger, the dread of public speaking is all but universal. A plurality of Americans cite it as their number-one fear. Even seasoned actors feel gut-wrenching terror at the prospect of stepping out into the sea of eyes that awaits them onstage. It’s not uncommon to hear of singers and actors who vomit before each performance. There is something about standing in the direct gaze of hundreds or thousands of people that jolts the human psyche. But full-blown stage fright is an even more mysterious, unpredictable, and potentially devastating phenomenon than the usual pre-show jitters. In its mildest form, it’s called “going up”: the performer finds herself suddenly, blocked, dry, her performance at an unexpected halt. She doesn’t know the line, she doesn’t know what to do next. All eyes are on her, and she’s lost. If she’s lucky, she’ll regain her footing, and the moment will pass. If she’s unlucky, the crisis will be far more severe. Actors have become paralyzed, struck mute on stage as minute after awful minute crawl by, or run panicked from the stage. They may even, like Durkin, decide that they must abandon their livelihood altogether. We tend to imagine that novices are more susceptible to getting spooked than grizzled veterans are, but in fact a performer’s first attack of stagefright tends to occur in mid-career. Often, it occurs in the wake of other stress in a person’s life. Once unleashed it’s a demon that from then on lurks in the margins of awareness, always threatening to reappear. One study of symphony and opera musicians found that 24 percent listed stage fright as a primary health concern. A performer gripped by stage fright finds himself gripped by a worsening spiral of self-awareness that tramples the automaticity of expertise. It’s a vicious circle, as the unfolding disaster only confirms the terrible nature of the underlying fear. 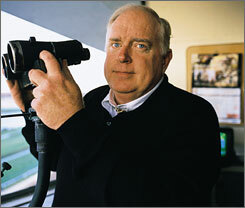 Unfortunately, Tom Durkin wasn’t able to get him to that place. I hope that he’s able to get treatment and overcome his anxieties. In the meantime, his trauma may help to bring public attention to how severe and debilitating anxiety can be, and how randomly it can strike. If any readers have experiences with battling fear in their professional lives, I’d be very interested to hear them. I’ve suffered from attacks of this stripe (though probably not as severe as Mr. Durkin’s seem) for years. I suspect that the symptoms are indescribable to someone who has not gone through them. In my experience, medication can reduce symptom intensity, without necessarily banishing it. Coping at work (I make presentations to groups now and then) is possible, but not easy. Although I can’t imagine anyone better prepared to call a big horse race than Mr. Durkin, I can corroborate Dr. Hamilton’s advice about how being prepared makes the problem easier to handle. Incidentally, Mr. Durkin has not surrendered to his symptoms. His decision would be similar to that of a long-term practitioner of judo deciding instead to study tai chi after a nasty injury. I wouldn’t want to impugn his courage; no one who hasn’t been through this kind of attack can appreciate the gravity of it. But the fact remains that he was forced to abandon his livelihood, or at most the most high-profile (and I imagine, lucrative) part of it. It would be nice to think that a generation from now advances in the treatment of anxiety will mean that that kind of sacrifice will no longer be necessary. Im a singer, i throw up before gigs, sometimes after the gig it happens too. I know that the fear hasnt gripped me, but vomiting from nerves is just as career destroying as it kills your insides and completely wares you out. I really dont know what to do..
Don’t despair! Treatment is available, and it is effective. I suggest that you consult with a therapist who specializes in performance anxiety. Both cognitive behavior therapy and SSRIs can help a majority of sufferers. Many performers (especially musicians) have found that taking a benzodiazepene such as Xanax can be very effective, although many psychiatrists are reluctant to prescribe them as these drugs can be addictive. At any rate, hang in there, and good luck! This is a very good article and helpful for me. Recently in a job I found myself in state of panic and had to leave early because I couldn’t focus at all. Every day for the next 3 weeks was similar. The panic was accompanied by my heart racing uncontrollably. I went to a doctor after the first week and he didn’t ask me much and told me I had anxiety and he could prescribe something for it. I declined and told him I’d prefer to try exercise. After 3 weeks I realized that had started taking phenylephrine 3 days before the attacks started. I took only two to three phenylephrine pills per week for those 3 weeks. I stopped taking them and the racing heart and anxiety started declining after a week. After a month off of it, I’m nearly free of the anxiety, it’s been a tough battle, though. Lots of vitamins and exercise when I can. I know phenylephrine may not cause most of the fear problems out there, but medicine is a factor that everyone, doctors especially, need to think about when fighting this problem. Thanks for the article!